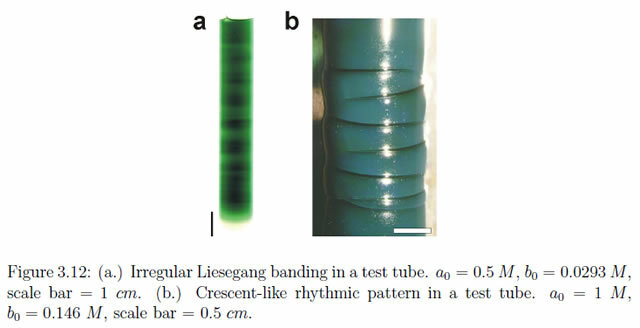 The previous posting on the Liesegang Phenomenon focussed upon the precipitation reaction that produces Liesegang Rings with normal banding where the space between consecutive bands increases. Pattern formation can also emerge behind moving fronts that “activate” the field they sweep through. 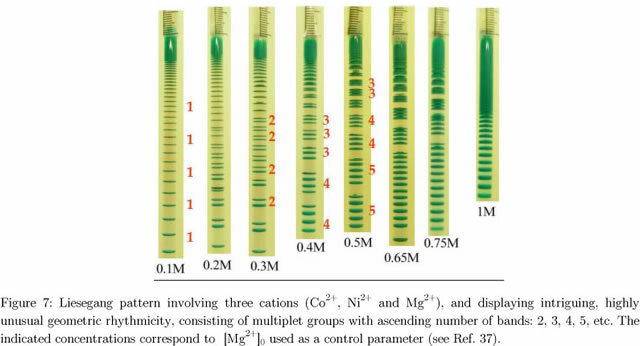 In the Liesegang phenomenon a rhythmic precipitate forms in the wake of the diffusion front of electrolyte A that penetrates into a gel containing electrolyte B. 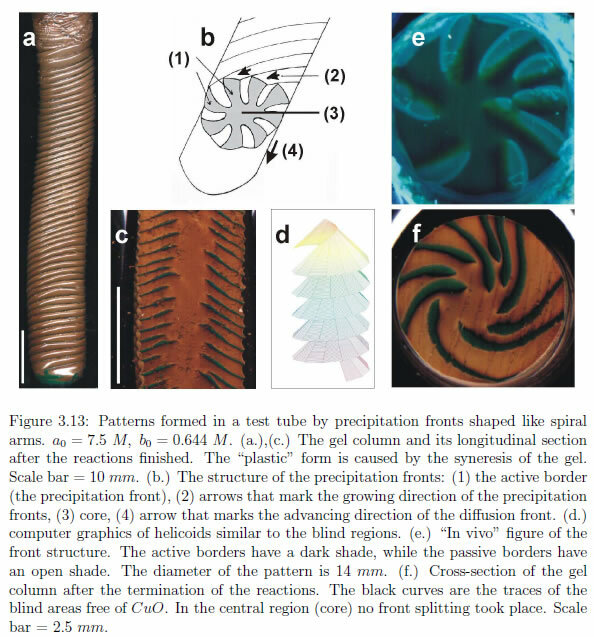 The observed precipitation patterns usually consist of a set of bands, rings or spherical shells (depending on the geometry of the system) clearly separated in the direction perpendicular to the motion of the front. Inverse [or Revert] Banding where the spacing decreases between bands. Double Banding where there are two banding periodicities in the same system. 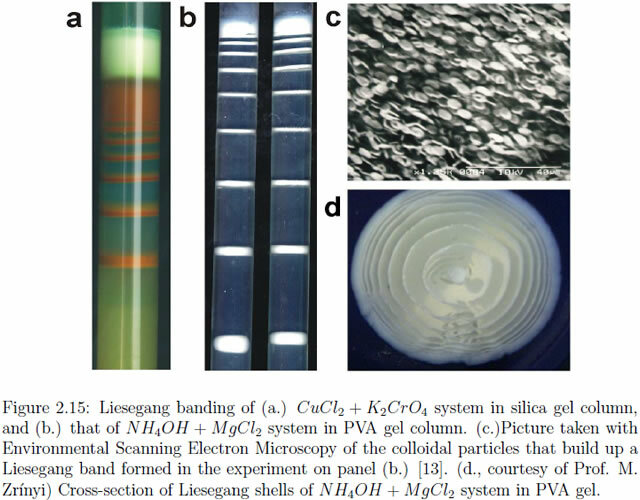 pitate ions interdiffuse in a gel medium, the sparingly soluble salt may precipitate in a stratification of parallel bands, traditionally known as Liesegang bands. 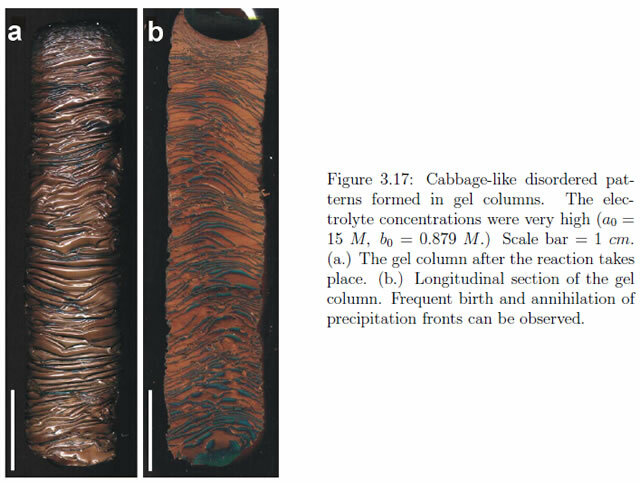 In some salt systems, the precipitate can redissolve in excess diffusing electrolyte due to complex formation. As a result, the whole pattern propagates via band formation due to precipitation and band disappearance due to redissolution driven by complex formation. Propagating fronts in periodic precipitation systems with redissolution. 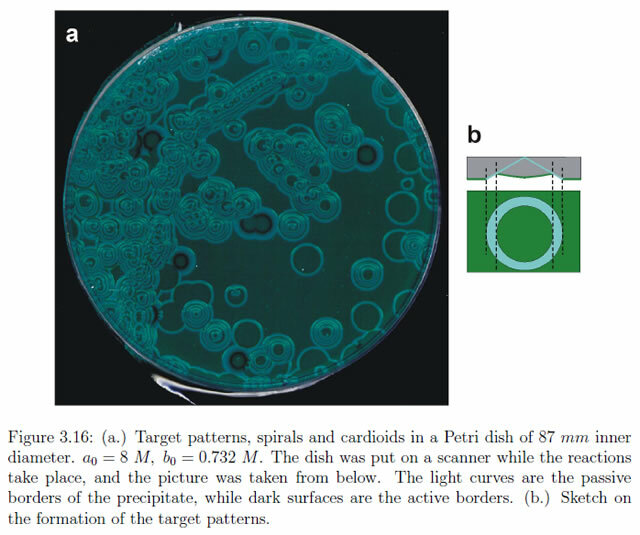 Two-dimensional Liesegang patterns formed when the boundary between electrolytes is polygonal display a variety of patterns, such as dislocations (radial alleys of gaps), branches (anastomoses) and spirals, many of which can be found in nature. Each vertex of the polygon can produce a pair of dislocation lines or branch lines. The effect caused by a vertex decreases with the number of vertices. Double-armed spirals are observed in experiments with a pentagonal boundary. Hexagons, which begin to approach smooth circular boundaries, do not give rise to dislocations, but instead yield concentric precipitation rings. 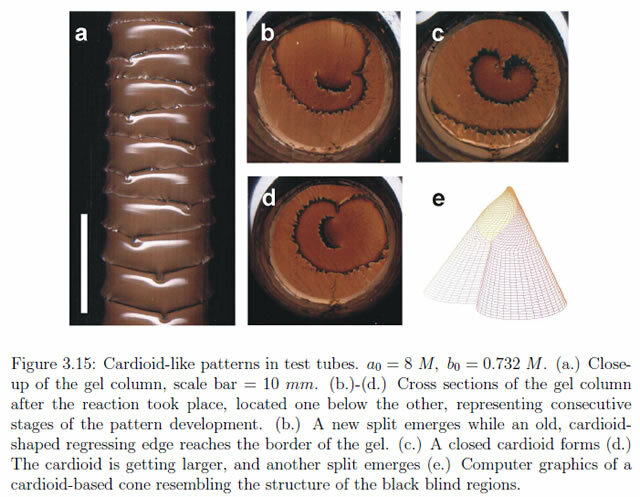 A simple model of nucleation growth enables us to simulate dislocations and spirals consistent with those seen in our experiments. Liesegang patterns cover a large natural range. However, as we shall see in the next posting, Liesegang patterns are still very mysterious.